Here’s a car I had nearly forgotten about but I’m certain is destined to be a future classic. 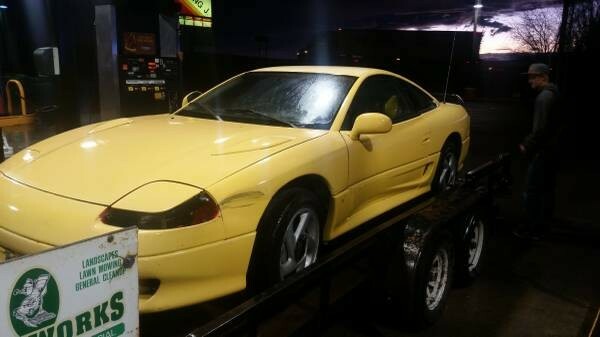 This 1991 Dodge Stealth R/T here on craigslist is a desirable twin-turbo model with all-wheel drive and a manual transmission. The seller does disclose it needs some work and it’s likely to be somewhat pricey given how many systems came together to make this car perform the way it did. But with so many examples modified beyond any semblance of a cost-feasible return to stock condition, I’d rather start with a car that just needs some basic R&R but is in original form at is core. With 300 bhp, ABS, four-wheel steering and the ability to hit 150 mph, this Stealth R/T could be a supercar on the cheap! Could be a fun car for cheap! I always liked these. IMO, a “driveable dream,” a la Hemmings jargon, and a future collectible. Not to mention a very snappy, AWD, stick-shift fun-machine. A CAR FAX (to check out the P.O.’s history for TRUTH, where possible) and an underbody inspection, for corrosion, is a must, IMO. Then, if it passes the above, as always, a PPI from a knowledgeable, marque-specific enthusiast is $200.-300. well-spent. Wow, I can’t remember seeing one of these anywhere near this price. These and the Mitsubishi 3000GT vr4 have held value more than the non turbo front wheel drive models. I would be really surprised if this lasts more than a few days. I’ve owned the less desired model I mentioned and it was a quick and good handling car but no where near the beast featured here. At the $2,500 asking price it would be hard to go wrong if it’s as described by the seller. © 2019 Credit Card Classics. All rights reserved.